Lake Utonai-ko is a fresh water lake located at 11km to the northeast of the industrial area of Tomakomai City, in the south of Ishikari lowland area between Sapporo and Tomakomai, 8km from the Pacific coast and in the northwest edge of Yufutsu-genya plain. The lake has a perimeter of 9km and an area of 275ha while it is very shallow with the deepest point of 120cm and the average depth of 60cm. The area belongs to the western Pacific climatic province where the climate is mild with less snow and more sunny days in winter despite its location in Hokkaido. It is close to Sapporo City and New-Chitose airport. Lake Utonai-ko is the only place which retains a remnant of unspoiled old Yufutsu-genya plain which used to be comparable to Kushiro-shitsugen wetland , the biggest wetland in Japan. In 1981, Wild Bird Society of Japan (WBSJ) established the first sanctuary of Japan, 'Utonai-ko Sanctuary', which has 510ha including the lake and surrounding areas. It was designated as a National Wildlife Protection Area (Special Protection Zone) in 1982, and the fourth Ramsar site in Japan in 1991. In 2004 WBSJ chose it as one of the 167 Important Bird Areas　(IBA: a project conducted by BirdLife International, an international bird conservation organization, together with partners and organizations of over 100 countries). In 2006, it participated in the East Asian-Australasian Flyway Partnership as an important habitat for migrating waterfowl. Due to the industrial development in the eastern part of Tomakomai City as well as the river improvement works, most of Yufutsu-genya plain has been exploited since 1975 and, as a result, wetlands remain only around Lake Utonai-ko. Yet the area is rich in nature, especially wild birds of which about 270 species have been recorded up to now which is about half of the bird species recorded in Japan so far. The number of geese, ducks and swans which stopover here during spring and autumn migrations sometimes reaches tens of thousands just in a day. Among the species listed subject to the Law for the Conservation of Endangered Species of Wild Fauna and Flora by the Ministry of Environment, Canada Goose, Oriental Stork, Northern Goshawk, White-tailed Eagle, Steller's Sea Eagle, Peregrine Falcon and Red-crowned Crane have been confirmed here. WBSJ launched the movement to establish Japan's first sanctuary at the end of 1970's and collected donations totaling 100 million yen from all over the country. 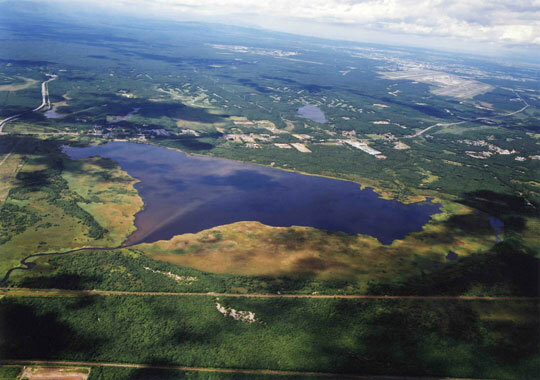 It decided to protect Lake Utonai-ko as the candidate for the first sanctuary because the area's environment had been endangered by rapid development. In cooperation with Tomakomai City, the first sanctuary of Japan was thus born in 1981. Since then, the rangers have always stayed there and put efforts on surveys around Lake Utonai-ko, management of its environment and environmental education. Representative natural habitats of the sanctuary are secondary forests of Quercus crispula, Alnus japonica and Magnolia praecocissima var. borealis, grasslands where Eastern Marsh Harrier and Yellow-breasted Bunting occur, watershed area of the Bibi-gawa river which flows in the lake, and Lake Utonai-ko to which waterfowl and swans migrate. Although there was once a plan to build the Chitose-gawa river drainage canal connecting with the Bibi-gawa river, and industrial development in central Hokkaido had powerfully proceeded this, the Bibi-gawa river has remained as a miraculously preserved primary river. Natural environment around Lake Utonai-ko as described above is highly evaluated internationally as well.